When other four-year-olds were still playing in sand, Eli Tomac was ripping his up with a dirt bike. His love for riding led to eight amateur racing titles before he stepped into the arena of pro motocross in 2010 and became the first rider in history to win the first race he entered. After six podium finishes in his rookie season, he went on to dominate the 250SX West Region in 2012, capturing his first Supercross championship. We're honouring the young speed demon from Colardo with a Signature Series edition of Oakley Airbrake™ goggles. The neon green camo graphics salute Eli's brother, who serves in the military. 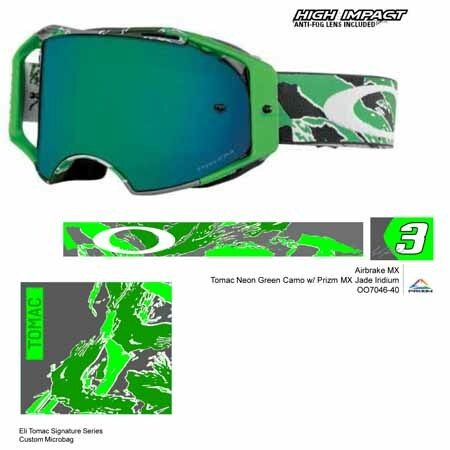 Optimised with a Prizm MX Jade Iridium lens, this collectible comes with a name tape strap patch that sports a print of Eli's Call Sign, plus a custom Microclear™ bag for lens cleaning and goggle storage. Additional name tape patches are also thrown in, including one that says "BAMF". (Yeah, that's right. Wear it proudly).